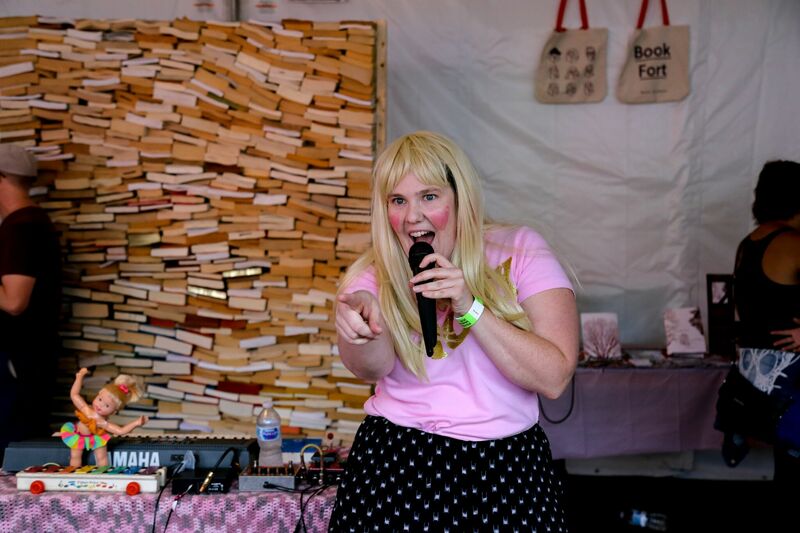 Book Fort is a mobile literary project that’s been operating at Pitchfork Music Festival (among other places) since 2012. 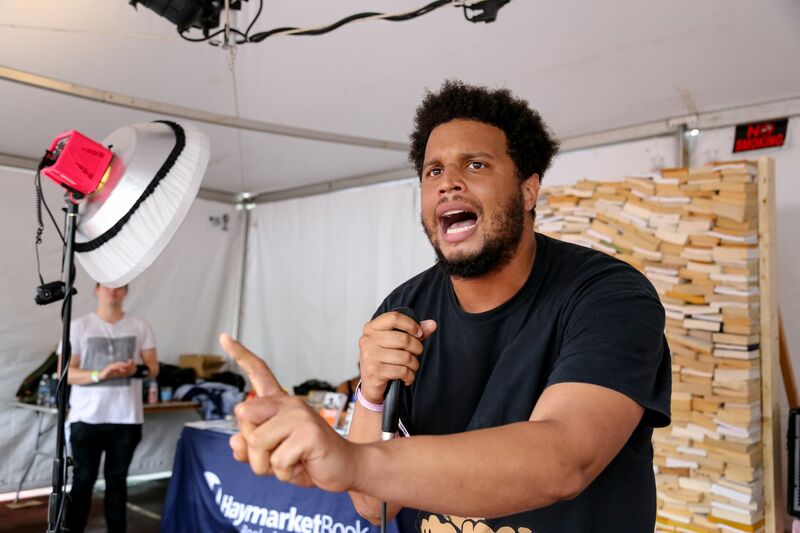 They feature publishers and magazines, host readings and performances, and, through book drives and fundraisers, advocate for free public access to literature and education in underserved communities. 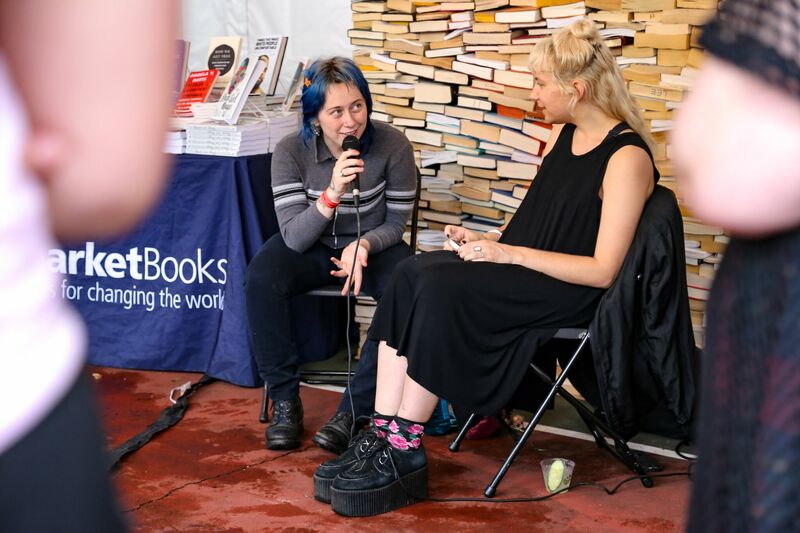 Friday began with the critic and writer Jenn Pelly in conversation with Harmony Tividad from the band Girlpool about protest and politics in music. Jenn also read from her book, The Raincoats, which tells the story of the iconic band. 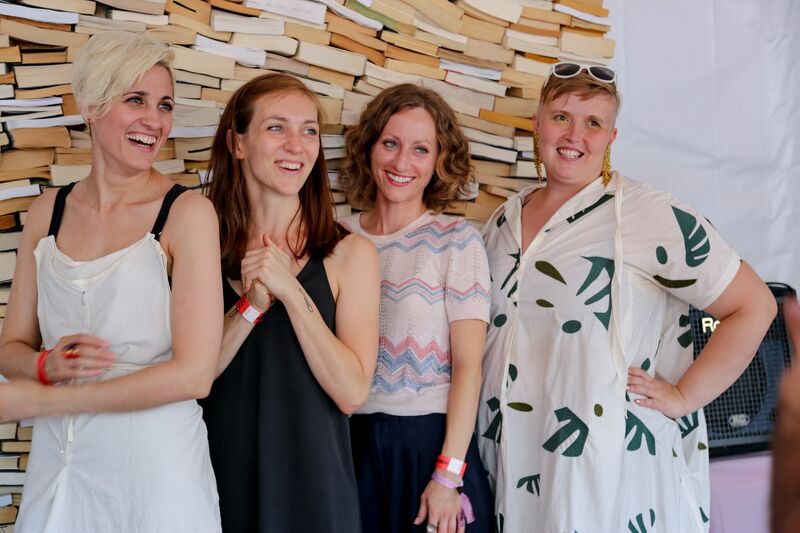 After Jenn (who asked buyers of her book to just Venmo her) four FSGO authors–Laura Adamczyk, Catherine Lacey, Maryse Meijer, and Jac Jemc–joined forces (with our audience) to do a version of mad-libs, where they substituted words from short stories of theirs with words suggested by the audience. It was as funny as you’d imagine, with the best line probably being Jac Jemc’s “I took possession of all of his fingers and strung them on a piece of hemp.” Same. Maryse and her identical twin sister, Danielle, also some read some tarot, because of course they did. 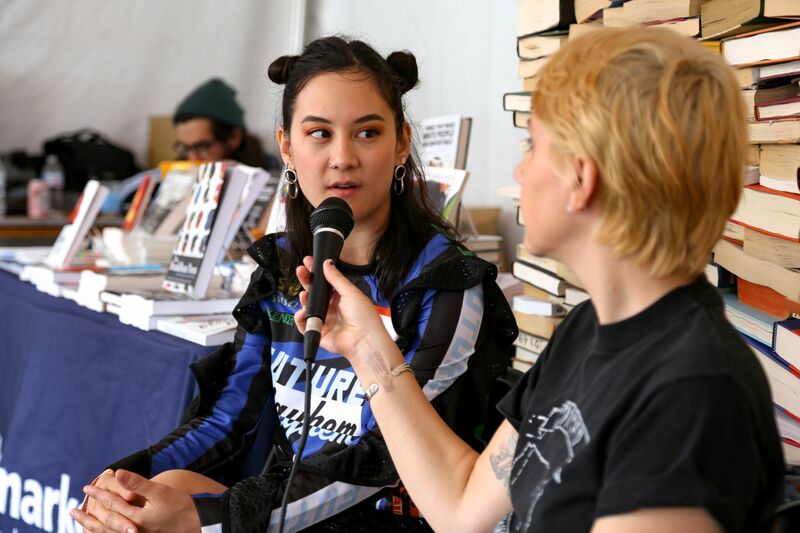 Next up, musician Lucy Dacus (who performed at the festival) spoke with Bandcamp’s managing editor (and all around icon) Jess Skolnik. Closing out day one (a lot of stuff!!) was the Closed Sessions crew, an indie label in Chicago who brought some energy and soul to an appreciative crowd. 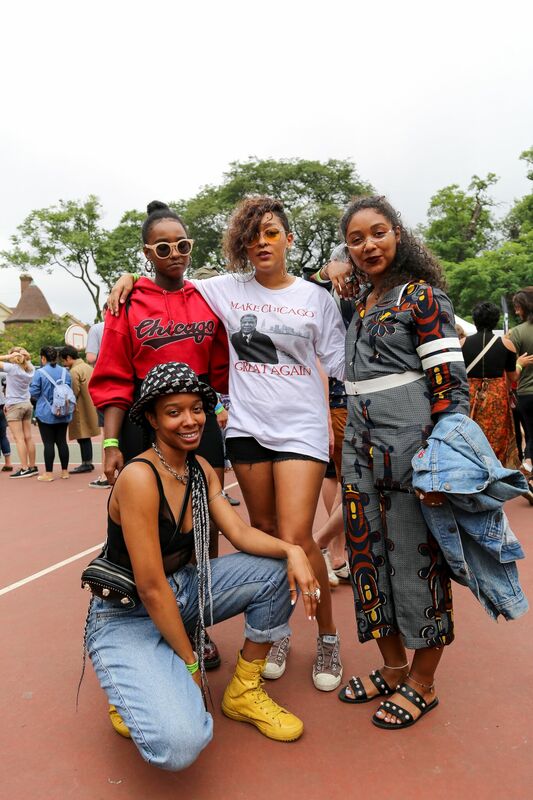 We also caught shows by Tierra Whack, Syd, and Tame Impala. Not bad. Day two brought a thunderstorm, which we persisted through by chugging the free (and very low calorie!) Bai drinks from the tent set-up across from ours. 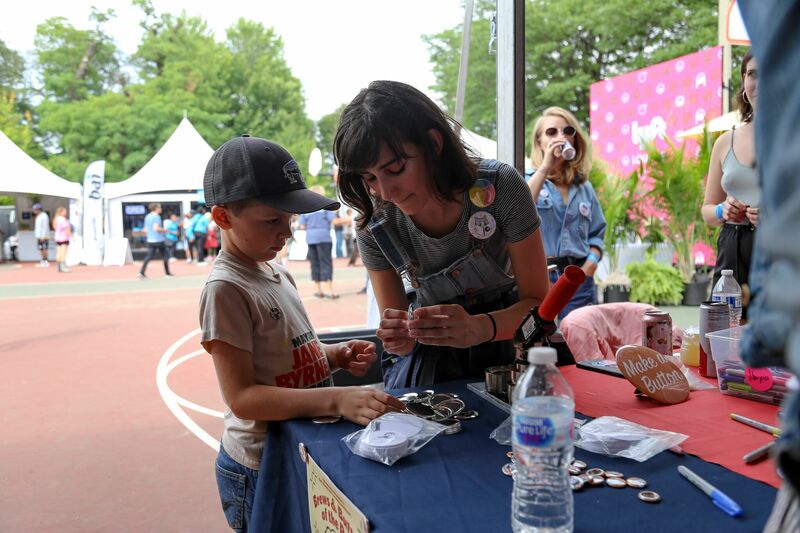 As the rain cleared, the folks from Busy Beaver Buttonshop (yes, they are real) set up for the day, allowing visitors to come by and, well, make some buttons. 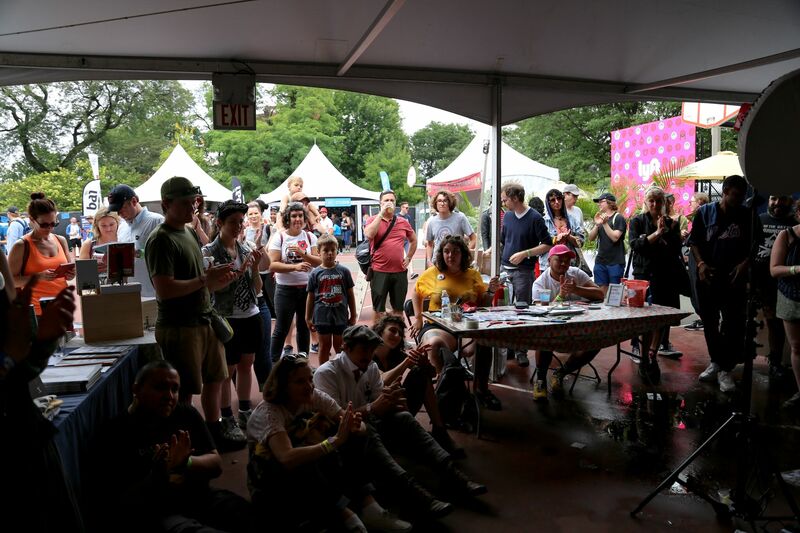 At 3, we hosted a comedy session with Jamie Loftus, Arish Singh, and a gang of other Chicago comedians who made us feel a bit better about the thunderstorm run-off soaking the floor. A few hours later, the ladies from Miss Spoken came to tell stories, which were definitely not kid appropriate but were absolutely hilarious, moving, and captivating. We also managed to sneak off and catch sets by Raphael Saadiq and The War on Drugs. 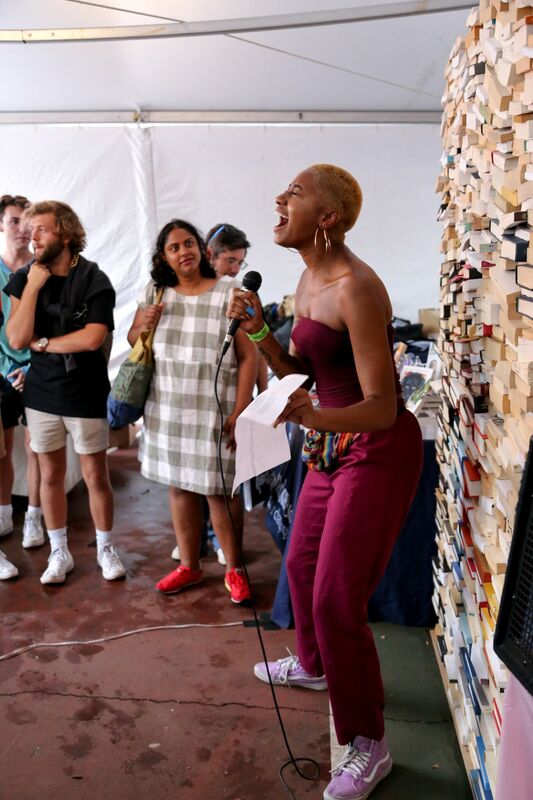 Young Chicago Authors came through next with a showcase of their best and brightest repping for the Louder Than a Bomb youth poetry festival, drawing a big audience and electrifying our (makeshift) stage with spoken word poetry and rapping. 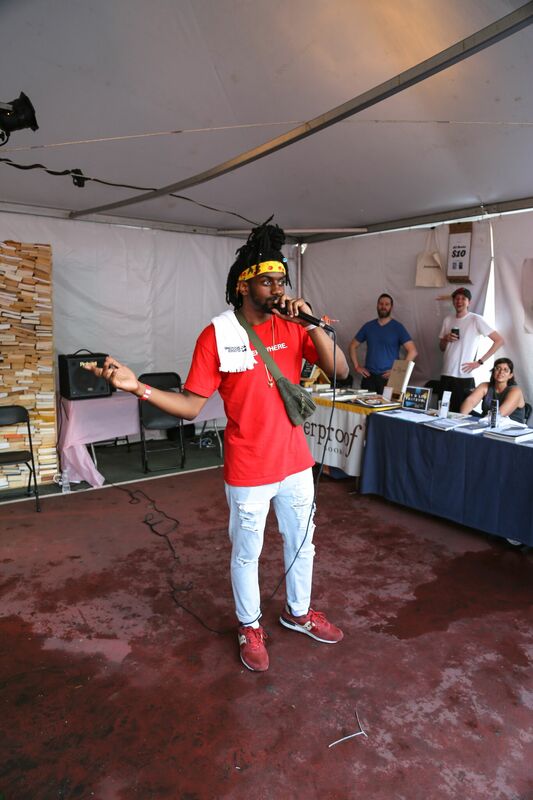 Nearly every Chicago rapper–from Chance the Rapper to Noname to Vic Mensa–has passed through their programs, and we are here for it. After a conversation between the critic Britt Julious and the group Irreversible Entanglements came one of our most highly-anticipated events: the Black Girl Magic poetry reading, featuring Eve Ewing, Jamila Woods, Raych Jackson, Kara Jackson, Britteney Black Rose Kapri, E’Mon Lauren and Safia Elhillo. Performing work from their new book (out from Haymarket) the girls drew the largest audience of the weekend. Finally, shutting the weekend down was the musician and artist Marcia Custer who, among other moments of brilliant craziness, played a comb as an instrument. Thanks to everyone who came out, and see you next year!! !